Well here’s something new! V2 Cigs just introduced the VERTX and the VERTX Plus e-cigarette. 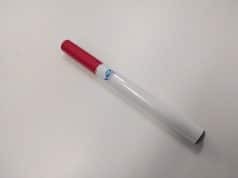 These are fairly small e-cigarettes at 151mm long (with a cartridge installed), while supposedly packing a punch. 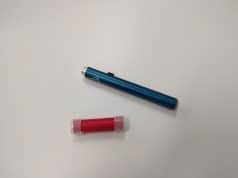 With a 420 mAh battery, cartridges that attach using magnets, touchscreen controls and variable voltage settings (for the Plus model), it looks like V2 might be onto something. The cartridges contain 1.6ml, enough to get you through a full day. Unfortunately, they are rather expensive, but it’s still much cheaper than the Juul. V2 is not selling blanks at the moment – given the design of the VERTX, I’m not sure if it would even be possible. V2 plans to sell blank cartridges later this year, making this e-cigarette much easier on the wallet. I’ll be sure to review it as soon as I can get my hands one one. It’s always interesting to try out new technology!